SLH Home Systems Has Moved! Burnsville, MN—When Sure-Lock-Homes opened in 1985 the main offering was home security systems. Now, after 30 years, SLH Home Systems has grown to offer many more services. The growth spurred the need for larger facilities as well as a new showroom for local clients. With the sophistication of today’s electronics users have unlimited options when designing truly modern spaces that integrate security, audio, video, and automation. 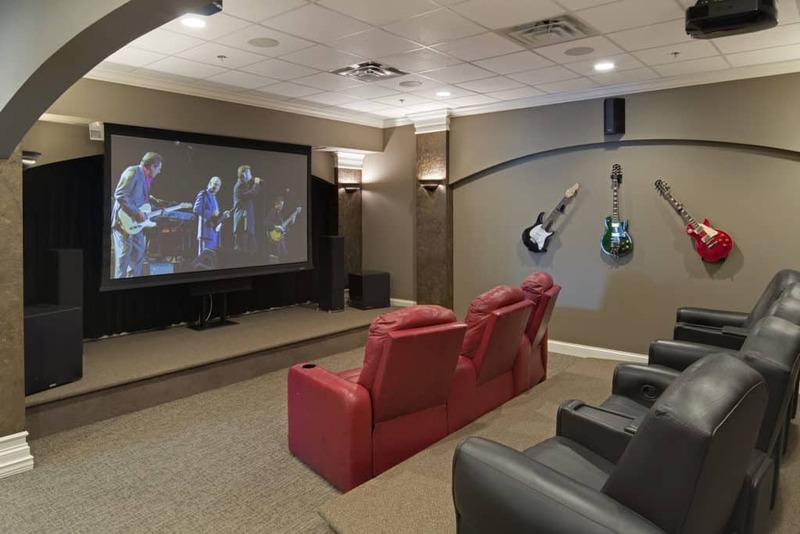 This gives SLH the opportunity to create a dedicated home theater space where clients can actually sit and experience a movie or concert. The new space is located in Burnsville giving Twin Cities residents a chance to look at SLH’s displays for home automation, security, and other custom integrated technology. Part of the design was contributed to by local designers Che Bella Interiors, which provided the custom entry flooring and other design details. The space included a Sony projector and a fully automated integrated Control 4 system that manages lighting control, thermostat, security, camera systems, music, and more. There’s also a dedicated conference room which we can display blueprints, etc. while meeting with clients. Also displayed are some of owner Don Hains’ album collection that he has had since high school. “The cool part about how we hung them is we can remove them and actually play the albums on our new turn table,” says Hains. Hains encourages prospective clients to call ahead and make an appointment so they can have a dedicated person to meet with. When making decisions for home integrations systems, SLH aims to establish a relationship with a representative to make the process easier and to adequately assess the needs of each client’s design and install. For more information or to schedule an appointment to visit SLH Home System’s showroom, call 952-224-5450 or email info@slhsystems.com.